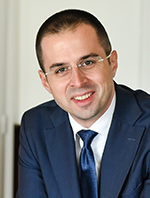 Bogdan Gecić (Getzich) is a founding partner at Gecić Law in Belgrade. His practice focuses on Competition/State Aid, European Law, Trade & Enlargement and Administrative & Regulatory. Other areas of expertise include Government Affairs, Corporate/M&A and Constitutional Litigation. Bogdan has significant experience in EU Law and its application in antitrust / competition law, state aid and trade policy negotiations. He is one of a small number of practitioners from the Western Balkan region (Croatia, Serbia, Bosnia, Macedonia, and Montenegro) to have practiced and represented clients before the European Commission in Brussels, and is currently involved in a number of cases before the EC. Recently, Bogdan advised and represented the Government of Serbia and Zelezara Smederevo in the first anti-dumping proceedings against Serbia before the European Commission concerning imports of certain hot-rolled flat products of iron, non-alloy or other alloy steel originated in Brazil, Iran, Russia, Serbia and Ukraine. He also supported Air Serbia in an investigation before the European Commission in relation to Etihad Airways’ investment in the Serbian Airline. He has particular experience in advising clients on antitrust and state aid matters in the emerging Balkan markets (Bosnia & Herzegovina, Croatia, Macedonia, Montenegro, Serbia), as well as expertise in developing and implementing corporate antitrust compliance programs. He assisted clients in merger filings with EU and national competition authorities, and counseled multinational clients in cases concerning alleged competition abuses. With respect to antitrust litigation, Bogdan’s practice also included cases that dealt with the complex interaction between European administrative law and ECHR (human rights) proceedings. He is also a former associate at Cadwalader, Wickersham & Taft LLP, Brussels office, where he worked on a number of major projects before the European Commission, including the DB-NYSE attempted tie-up; Aer Lingus-Ryanair’s minority share battle; and, as the intervening party for DHL in the UPS-TNT unsuccessful merger. He published extensively on EU and Balkan competition law matters. Bogdan is distinguished as one of the nominees in the global 2013 Antitrust Writing Awards competition held in Washington, DC (link). Bogdan graduated from the University of Belgrade with a degree in Law (Top 1% of class) and earned his LL.M. from Harvard Law School (with Honors and the Dean’s Scholar Prize in “Leadership in Law Firms”). He is a co-founder and the first Vice President of Harvard Club of Serbia and a guest lecturer at the University of Belgrade, Faculty of Law. Bogdan is a member of the Bar in Belgrade, Serbia. He is fluent in English, Bosnian, Croatian, Montenegrin and Serbian.